The cap-and-trade concept is in relatively early stages of adoption in Latin America, with countries including Brazil considering implementing national programs. Chile joined Costa Rica and Mexico in adopting a carbon tax, with Mexico’s program allowing for the use of domestic offsets generated under a Kyoto Protocol program as a compliance option. The Brazilian state of Acre and the Mexican state of Chiapas signed a memorandum of understanding with the U.S. state of California in November 2010 that would allow the two jurisdictions to provide offsets from Reduced Emissions from Deforestation and forest Degradation (REDD) projects to the state’s cap-and-trade program. California has so far limited its interest in REDD projects to these two Latin American states and all three jurisdictions would have to sign off on the rules and regulations that would govern how these forestry projects can gain entrance into California’s program. The REDD+ Offset Working Group (ROW) was established in February 2011 to answer three central questions: (1) What legal and institutional mechanisms are required to enable California to recognize international REDD-based emission offsets for compliance purposes? (2) What are the key policy considerations a sectoral REDD program should address to achieve the level of performance needed for California to recognize the REDD-based offsets for compliance purposes? And (3) what should be the basis for judging the performance of the states in reducing carbon removals from forests? After two years of consultations with indigenous leaders, environmentalists, and government representatives, the ROW released its final recommendations on how to work international REDD+ offsets into California’s cap-and-trade program in July 2013. However, California regulators have given no timeframe for the potential start of a rulemaking process to allow REDD offsets into their program. In 2009, Brazil voluntarily committed to reduce emissions by 36.1%-38.9% below business-as-usual by 2020. The country is expected to submit its Intended Nationally Determined Contribution to the United Nations Framework Convention on Climate Change in October 2015, according to Brazil: An Emissions Trading Case Study. Brazil’s National Policy on Climate Change explicitly mentions mechanisms that could support Emissions Trading System (ETS) activity and authorizes the creation of a carbon market, according to the case study. As a result, over the last four years there has been increased consideration of the development of a national cap-and-trade program in Brazil, with a working group created to assess the potential for carbon pricing and the possible impact on the Brazilian economy, the case study noted. In March 2013, the Brazilian Development Bank signed a technical cooperation agreement with the state of Rio de Janeiro and the Acre Institute for Climate Change and Regulation of Environmental Services to work toward the development of a carbon market in the country. Rio and Acre were chosen specifically because both have experience with carbon market development, according to the case study. Both Rio and Sao Paulo planned to launch carbon markets that would eventually link, but those plans have not been implemented to date due to opposition from regulated entities. In 2012, Brazil reduced deforestation 76% below the 1996-2005 average, a greater emissions reduction than in any other country, according to the case study. However, recent data shows that from 2012-2013, deforestation actually rose by 29%, leading to an increase in Brazil’s national carbon dioxide (CO2) emissions by 7.8%. The largest sources of this increase are in the land-use change and forestry sector – accounting for 35% of total greenhouse gas (GHG) emissions in 2013 – and an increased dependency on fossil fuels due to unfavorable environmental conditions for hydroelectric generation. The rate of deforestation dropped by 18% between 2013 and 2014, but appears to be increasing again, according to the case study. Six Brazilian states – Acre, Amapa, Amazonas, Mato Grosso, Para, and Tocantins – participate in the Governors’ Climate and Forests Task Force, which is a multi-jurisdictional collaborative effort between 22 states and provinces from Brazil, Indonesia, Mexico, Nigeria, Peru, Spain, and the United States established in 2009 designed to scale efforts to prevent deforestation. In 2014, the Chilean parliament approved a carbon tax of US$5/tCO2e to start in 2018 and cover power facilities with capacity above 50 megawatts, according to Carbon Pricing Watch 2015. Chile has voluntarily committed to reduce its GHG emissions 20% by 2020 based on 2007 levels. In 1997, Costa Rica enacted a tax on carbon pollution, set at 3.5% of the market value of fossil fuels. The revenues generated by the tax goes toward the Payment for Environmental Services program, which offers incentives to property owners to practice sustainable development and forest conservation, according to Putting a Price on Carbon with a Tax. In 2012, Mexico adopted a carbon tax covering fossil fuel sales and imports by manufacturers, producers, and importers, according to Putting a Price on Carbon with a Tax. It is not a tax on the full carbon content of fuels, but on the additional amount of emissions that would be generated if fossil fuel were used instead of natural gas. The tax rate is capped at 3% of the sales price of the fuel. Companies liable to pay the tax may choose to pay with offsets from Clean Development Mechanism projects developed in Mexico, equivalent to the value of the offsets at the time of paying the tax. Home to the world’s largest tropical rainforest, it’s no surprise that trees matter in Latin American voluntary carbon markets. Forestry projects made up 87% of the total 21 million tonnes (MtCO2e) transacted in 2014, according to Ecosystem Marketplace’s State of the Voluntary Carbon Markets 2015 report. Historically, the region has worked on a variety of carbon market mechanisms – including voluntary domestic programs, bilateral partnerships, and private development – that have spurred voluntary demand. In 2014, Latin America transacted the most offsets of any region for the first time. A significant portion of that demand is attributed to the REDD Early Movers program, through which Germany and (more recently) Norway have contracted 18 MtCO2e in emissions reductions through payment-for-performance agreements with the state of Acre, Brazil (8 MtCO2e in 2013) and the national government of Ecuador (10 MtCO2e in 2014) – propelling Ecuador onto the international REDD (reduced emissions from deforestation and forest degradation) stage last year. Behind Ecuador, Brazil supplied 4.6 MtCO2e in 2014, with Peru close behind at 4.2 MtCO2e. Project developers attributed Peru’s volume in part to voluntary demand surrounding the international climate negotiations hosted in Lima last December. The fourth-largest volume stemmed from Central America, which collectively transacted 2 MtCO2e – led by Guatemala-based projects, which contracted 1.1 MtCO2e. Though developing countries are typically a source of offset supply rather than demand, buyers within Latin America’s developing countries contracted 0.3 MtCO2e in 2014 – making up 74% of the total developing country demand (which in turn made up 1% of the overall volume). This demand is in part driven by government policies and incentives. 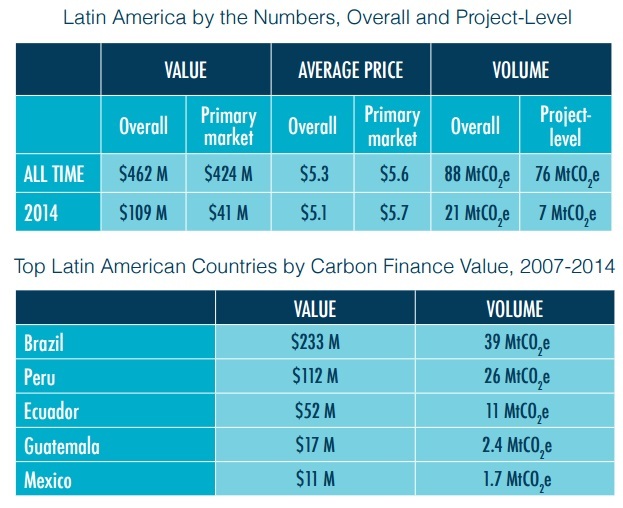 Several countries in Latin America have launched or plan to launch a carbon pricing mechanism. In September 2013, Costa Rica launched its Voluntary Domestic Carbon Market, which encourages domestic companies to offset using locally produced Costa Rican Compensation Units, CERs, and VCUs to earn a carbon neutrality label. Mexico launched its carbon tax in January 2014 and announced plans for an emission trading system to cover the electricity sector in February. The country’s National Emissions Registry commenced last October and mandates that facilities with annual emissions above 25,000 tonnes report on their emissions in addition to voluntarily registering any mitigation or reduction projects and activities. Brazil is still contemplating both a carbon tax and a cap-and-trade program, with a decision expected by 2017. Suppliers in the region are skeptical that either national approach would include a provision for offsets. Meanwhile, the private sector, non-profit organizations, and sub-national jurisdictional suppliers have earned a collective $233 million from the voluntary carbon markets over the years. Chile officially adopted a carbon tax in 2014, making it the first South American country to price carbon dioxide emissions. Unlike Mexico, however, it does not include a provision for offsets. Instead, voluntary offsetters can continue to trade on the Santiago Climate Exchange, a local platform for voluntary carbon offset trading established in 2009, or through the Chilean government’s platform for trading forestry offsets, established in 2013 with the Verified Carbon Standard.